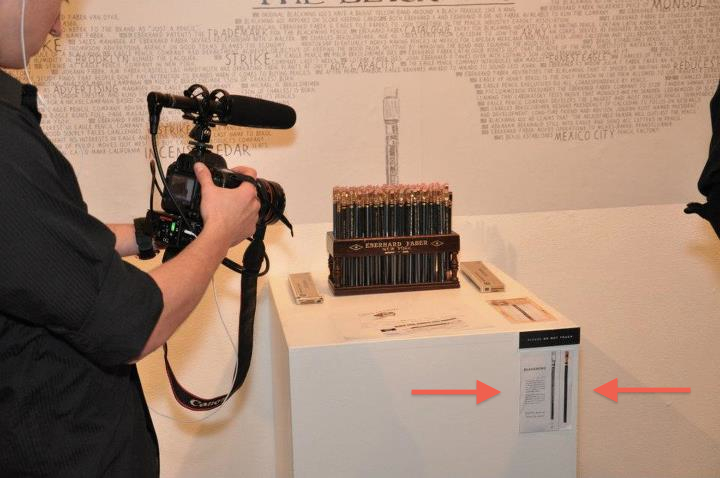 Recently published photographs from California Cedar’s “Blackwing Experience” at the Art Director’s Club in New York contained some images that looked very familiar. The image between the arrows was taken from this site. Photo Credit: California Cedar Blackwing Experience Facebook page (Click to enlarge). It’s possible that they arrived at this image independently, but given the other items, it seems more likely that it was seen here first. I posted this just to further document a trend. I can’t say with certainty, based on the photographs, whether my name or my blog is credited for each item, but it doesn’t appear so. No one mentioned their intention to use the materials. Some items are under my copyright, others aren’t, however they are all from this blog. If I am mistaken about this, I invite Mr. Berolzheimer to please contact me. Pending proof, I will amend my statement about the work having been taken from my blog. No one gets to say “I didn’t know”. Parties were aware by April 10th that some of my work was already appropriated for a video prepared for this event, and these photographs were taken approximately one week later. I don’t know if the displays were prepared by California Cedar or by someone else, but they had to have been approved by California Cedar since they were present for this week-long exhibit. I can’t say with certainty that this isn’t just a coincidence. However, I can say with certainty that it would have to be an immeasurable and incomprehensibly big coincidence. Though copyright is a concern here, it’s more about something else: that same feeling you get when someone next to you is copying off of your test. If that person scores highly on the test, you’re certainly not upset about going uncredited—you’re upset someone has copied off of you, even if the person admits to it. I too am interested in what the company has to say about this. Given the brand name, I fear that it might be a bunch of horse—-. Pardon my French. I can’t say I’m very interested in a response—only if I’ve got some fact(s) wrong; the official position has been issued elsewhere. If someone were telling me this whole story though, I don’t think I would believe it at first. I just posted this on their facebook page. They might have redone the side-by-photo, might have digged up the old catalogues and might have bought the score keeping card from eBay – but even if they did that, which is not that likely, it is more than likely that the inspiration came from your blog. Anyone with a blog begins to understand after a while that text and images can and will be misappropriated by spammers and various miscreants. But, this behavior isn’t expected from established companies, and especially not from friends. The ongoing use of your extensive body of work by others for profit, without either attribution or compensation, is wrong. Thanks, Stephen. I appreciate you taking the time to say so. 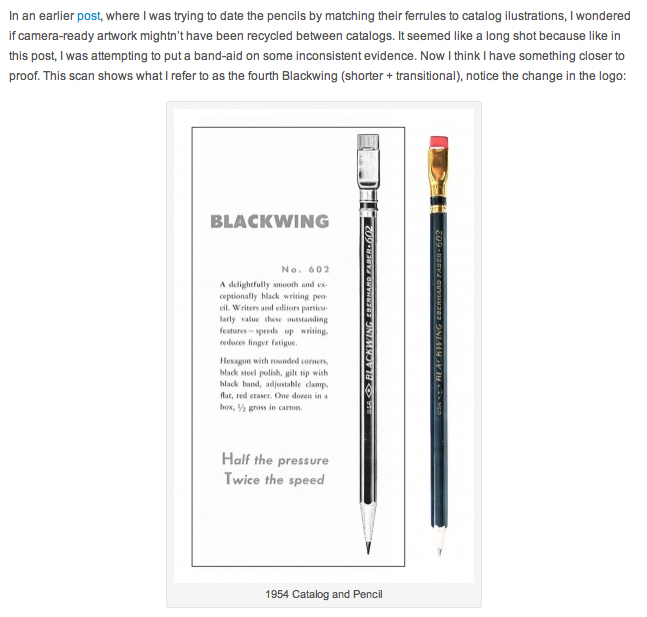 Thought you might be interested in a P602BW review that has your website pegged as an anti Cal Cedar site http://mslogica.com/2012/05/product-review-the-blackwing-602-pencil/ I commented on her article but thought that you might want to have the chance to retort directly. I would have e-mailed this to you but I’ll be darned if I can find a way to do that. Please delete this if you consider it inappropriate. Keep up the good work Sean. Thanks for the support, Jim. For her to simply label this as an “anti-Palomino” site, possible sarcasm notwithstanding, tells me she likely wouldn’t benefit from further explanation. This company creeps me out! P.S. At one point, I was asked by the organizer of this event to lend my collection of Blackwings; this story about the props, combined with others, leads me to believe I would never have seen them again. Maybe he’ll accept a commission to make one an EF Blackwing? I’d surely hate to see them win (…by your deciding to stop blogging on the Blackwing 602). Your writing has not only raised the bar above simple ‘fan-dom’ adoration of a product, but the design aspect of your photographs have also brought the presentation into a fine art. Why can’t you simply place your watermark on your photos, so they can’t use them without attribution; if they try to remove the watermark, then the attorney gets busy. You could probably easily find a Lawyer to fight them Pro-Bono! I think their actions go beyond thievery….bordering on thuggery! Keep your blog. Success is the best revenge…. Thanks for your kind words of support, Theo. My interest in the Blackwing is of an entirely different order than CalCedar’s so there’s nothing to be “won” here, but I understand what you are saying. This site is not only a catalog of the Blackwing’s history it’s also a witness to the Palomino “revival”, and whether any of this will be of value to people in the future will have to be decided by others. To be honest I don’t like having CalCedar’s activities enumerated here—I think it sullies things. And if it were only about their advertising it’s very unlikely I would have even mentioned it here. In fact early readers of this blog may remember that I was always deferential to CalCedar and always gave them the benefit of the doubt, even when many other blogs were sharing their doubts and disappointments about their first attempt at a “Blackwing” as well as the fiasco surrounding the “pre-production” samples; hindsight tells us now that these were signs of things to come. But I didn’t write about any of that at the time—it wasn’t until it was clear that my work was being appropriated that a line was crossed, and I decided to document it. Regarding photos: early-on I experimented with watermarks, logos, and addresses, but even though I’m at the most a hobbyist photographer, they looked clumsy to me. But I also noticed early-on that photos such as the ones I was posting were unique in terms of their content, and I couldn’t imagine that someone would blatantly appropriate something so identifiable. Not bloggers, etc., mind you, but companies. As a teacher and a professional musician I’ve been exposed to every manner of plagiarism and copyright infringement you could imagine and for many years, but I was still shocked by the manner, frequency, and severity of what happened here. Still am. It wasn’t as much the photos as it was someone taking a free ride on my own research, most of which involves primary sources, without any acknowledgment and for the purposes of their own profit, and all from someone who claimed to be continuing the “legacy” of the Blackwing. The Blackwing is just an interest of mine; I’ve neither represented nor thought of myself as being an authority. But when you start a blog on such a narrow topic and you are the only one to do so, it’s understandable why presumptions might be made. However, readers of this blog will notice how frequently I have used phrases such as “I’m not sure, but…”, and “…it seems like…”, and “…I wonder if…”—hardly authoritative writing. I’m sure that there are many more people who know a lot more about this pencil than I do, it’s just that few have written much about it. And despite all of the work and research that has gone in to “No Ordinary Pencil” it’s still only the smallest fraction of the story. But the research continues, and it has taken me all the way to A.W. 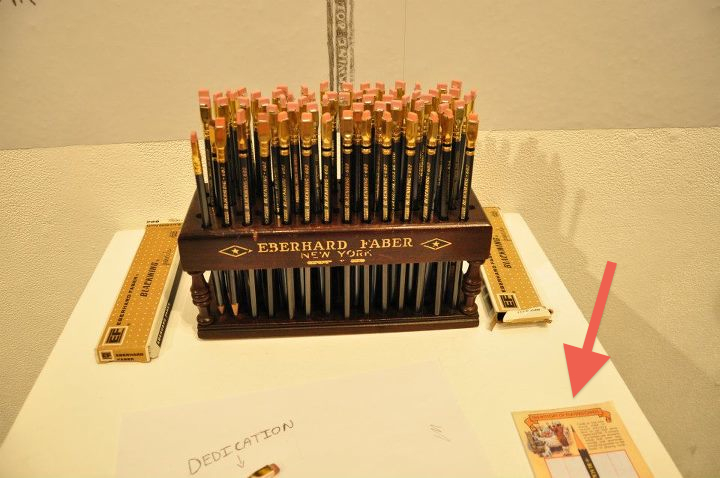 Faber-Castell in Germany, where I was able to do some research in their archives as well as spend time with Count Anton-Wolfgang von Faber-Castell discussing (among other things) the Blackwing. Count Faber-Castell examines some early Blackwing pencils. And this site continues to receive steady traffic — there have been visitors from more than 80 countries to date (and based on the IP logs, I notice that CalCedar still drops by from time to time too. In fact, just yesterday.). 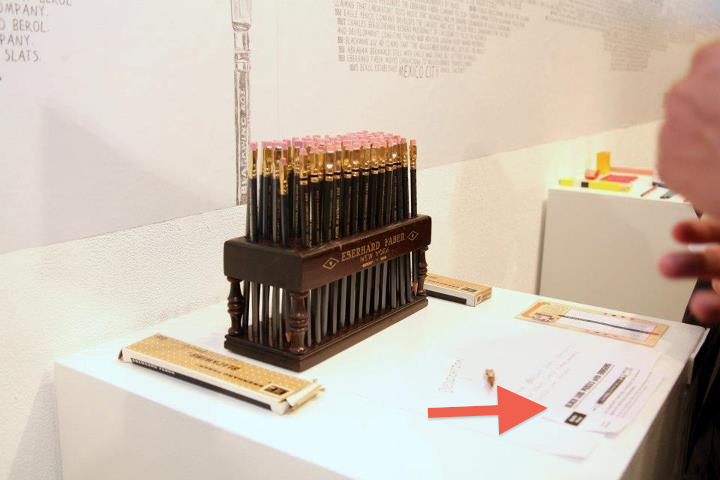 References and links to “No Ordinary Pencil” continue to grow not only online, but in print media as well. For example, just this week a book was published called “Contemporary Collecting: Objects, Practices, and the Fate of Things”, which has several pages (pp. 60-62) devoted to the Blackwing and contains quotations from this site (you can read those pages using the “Look Inside” feature at Amazon. NB: I’m not affiliated with this book or its authors). 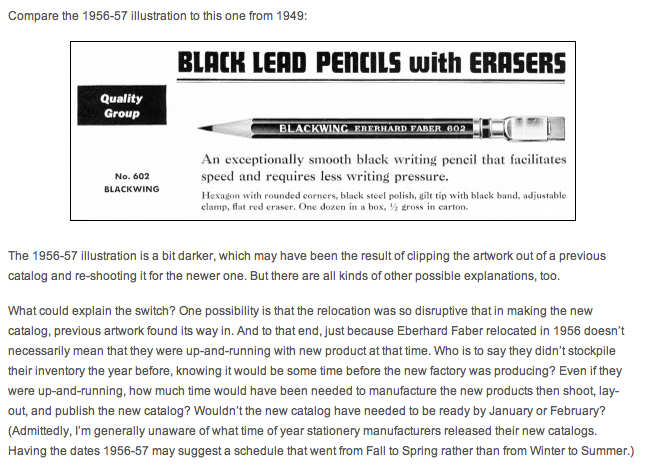 So to that end I think that Blackwing Pages continues to be “successful” so-to-speak, as a resource for those interested in the history of the Blackwing. 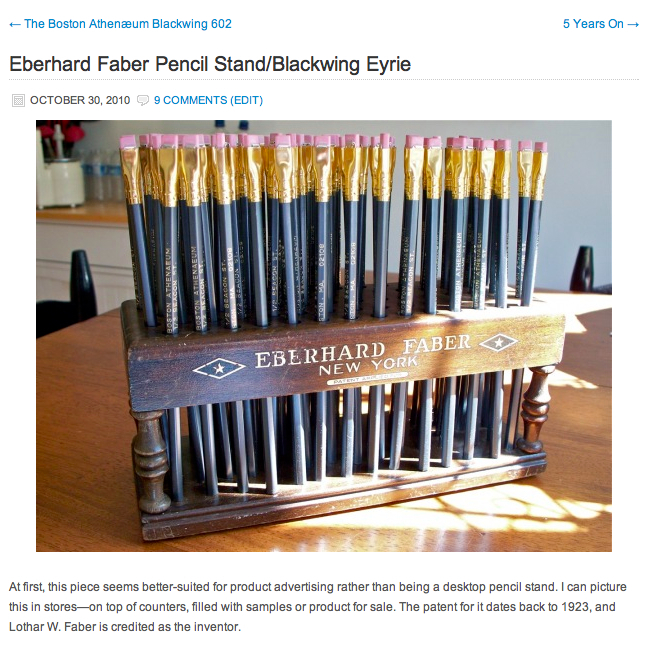 I’m still hopeful others will come forward, such as former employees of Eberhard Faber, to share what recollections they might have; I’ve spoken with a few already, and they have had some interesting and surprising stories to tell. I hope you continue periodic updates Sean. And I understand how the activities of CalCedar tend to take over the intended content of the blog as such things will do. Just sorry that lazy and morally vague businessmen can pollute a good thing and go on with their ‘business’ with a clear conscience. Hopefully their actions and ‘Cultural vandalism’ will catch up with them down the road, or maybe not. Best to not sink to their level and just continue doing the best work we can… letting the chips fall where they may…..best wishes for your endeavors! Will check out the collecting book…thanks for the tip. 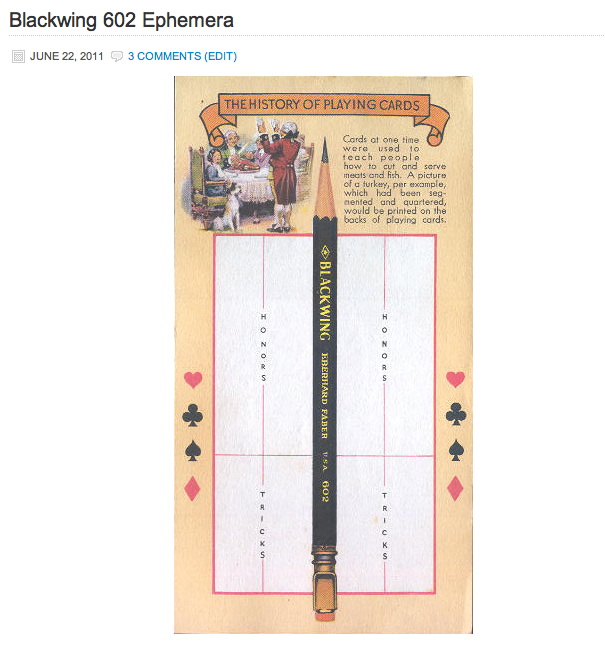 Have a look at this blatant plagiarism of my original blog post: http://pencils.com/frankenpencil/ No credit given anywhere to me as creator if this blog post. He has appropriated images I created for a specific and limited purpose into the branding of his products without giving me credit or compensation. It’s a pattern of behavior, unfortunately. What a way to build a brand, through appropriation and intellectual property theft. There was another prominent pencil blogger whose posts were echoed on pencils dot com, and again, without attribution. But then again just look at the product: someone else’s pencil. Exactly – and with all that “help” he wasn’t even able to make a good pencil.